Confessions of a dance pants addict: Fan veil performance! Last Friday I had a big pile of firsts happen all at once... My first private party gig, my first time doing a full 10 minute set by myself, my first fan veil solo and my first time getting tips (and thus my first time making money dancing as a soloist. I've done paid/tipped gigs with troupes, but the money has always gone back into troupe expenses). WHEW! Oh, it was also my first time wearing those pants. I've owned them for something like two years and never had the right occasion. Let me tell you, getting ready for this gig was really nerve-wracking. There's a big difference between being at an open stage, or doing a show with a troupe, and being solely responsible for entertaining people for ten whole minutes (ok, more like 9). Not only that, but I was going for a vintage-inspired look, which meant doing new things with my hair and makeup. Oh yes, and debuting a new-to-me prop. But everything worked out! The attendees of Kate's gem show party were entertained, they were entranced by the fan veils, and my hair stayed in place. 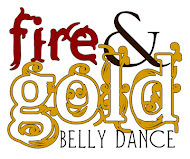 Also performing at this party was my friend and new Fire & Gold troupemate Sandy Tiss, who performs a more traditional Egyptian style bellydance. She wowed the guests with a veil entrance, zill playing, and a wonderfully sparkly turquoise and gold costume. She's a true professional and I was honored to share the "stage" with her. We even joined forces at the end for a little audience participatio. Anyway, I hope you enjoy the video of my very first fan veil performance, and look forward to more in the future! Oops, I forgot that since it's embedded, you don't see the YouTube description. The song is a shortened version of "Crooked Muse" by Beats Antique featuring Lynx. I loooove it. Thank you for the compliments! I really do enjoy veil props, the flow of the silk makes such a nice extension to the arm and hand movements.